The last WWB was a bit weaker than previous WWBs, and overall conditions have continued to ease back into neutral range. Currently trade winds are close to average and the forecast has some periods of both enhanced westerlies and enhanced easterlies, but is overall close to average. 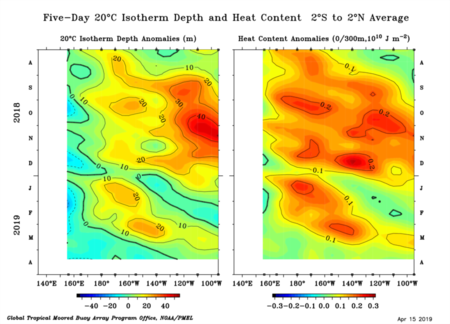 In the subsurface the last significant warm Kelvin wave is definitely over. Otherwise conditions are very close to neutral in the subsurface. There is still significant subsurface warmth north and south of the equator, and on the equator the shallow subsurface is warm and the deeper subsurface is cool. Westerly activity could easily bring back the subsurface warmth from north and south, and build on the shallow subsurface warmth. Easterly activity could easily bring up the deeper subsurface cool waters. So while current subsurface is quite neutral it is in some sense a bit unstable and could quickly go either way. 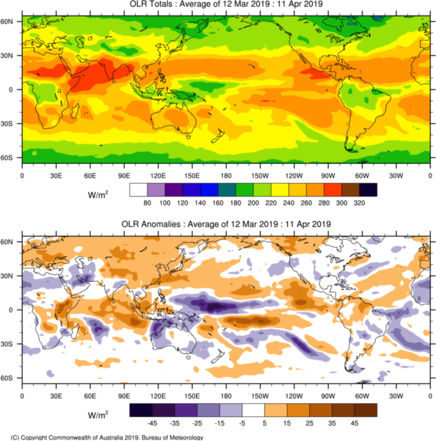 Cloudiness has in the last couple of months been much more el nino like. This underscores that trade wind activity, which for this event has been similar to other weak el ninos such as 2006 is the important atmospheric indicator, when determining whether the atmosphere is responding in a manner which can sustain or build an ENSO event. Cloudiness is if anything a negative feedback - if there is a strong cloudiness response during a warm event this will result in cooling, and weaken the event rather than strengthen it. Looking forward, all models are still forecasting warm neutral or el nino. The critical factor will be trade wind activity, with near neutral trades forecast in the short term. 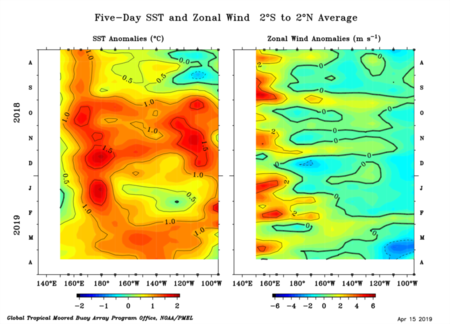 Overall the SST pattern would seem to be biased towards enhanced westerly activity with more warm anomalies in the tropical Pacific than cool. The eyes on the Pacific suggest drier and warmer for winter and spring is more likely. Do the eyes on the Indian suggest anything? Or is it a case of wait and see what happens and then claim that the Indian Ocean did it. .....coupled with a cooling SST trend in place at Nino1.2 (with trades persistent over that region), I'm skeptical that el nino is looming out in the Pacific. IF the MJO appears over phase 3/4 over coming weeks, then those with eyes focused on the Indian would be looking for signs of a -ve IOD. Don't take the bait Petros. The IOD is clearly more significant for this time of year than ENSO. Especially when ENSO is cooling and waning. Bom indicates if we get an El Nino, it will be short lived. Thinking about taking bets... Loser gets no comment's for Six months. Anyone game at this point in time ? I vote Mike  JOKES of course. Anyone have a good SAM index link? The only one I could find finished in 2015. Suspect it may be negative at present which is allowing the long wave troughs to amplify/peak over SW WA and drag down tropical moisture and generate NW cloud bands / AR’s. At the moment I think odds are more in favour of not a strong El Nino. But it is interesting reading comments on another US based forum only from a few months back and then the consensus was a medium to strong El Nino was a possibility. It shows that sometimes flipping a coin is just as an effective predictor of the weather. Yh it's currently negative although very slightly and it'll be trending positive. Another year of horrible April and May Rain for Southern Australia it looks like. Dunno bout that, seems to trending lower to the naked eye. Not Bloody again what do we have to catch a break. The only chance of warming off WA is for a reasonable MJO passage. Yep last couple of weeks has seen a return to Ningaloo Nina like patterns although not surpising given the synoptic pattern. Hard to say how long it persists, IOD not really affected as of yet and cooler off Africa, should remain dry till Mid May generally before a change in pattern from dominant highs to improvement in frontal activity with some possible feeds beginning. The fact that it's deviated so much from any form of warmth I think we can recognise some seriously cold water. Even if it's a daily measure. More likely the response to the recent nw cloud band / AR rather than some long term pattern. If the same next week then maybe more can be read into it. Generated in 0.022 seconds in which 0.010 seconds were spent on a total of 15 queries. Zlib compression disabled.